Yeah, sure this was an 'error'. Remember this folks, when the ‘GOP tsunami’ turns into a squeaker for the democrats late election night. So, is anybody in The Republican Party going to raise hell or are those girlie-men going to leave it to Fox News and talk radio and FReepers? Okay, so how can this election be valid? How can they discern which GOP votes were changed to Dem and which ones were legitimately Dem? Right... an ‘error’ intentionally embedded in the design... and I am sure it was in place right from the start! Calibration error? BS. This stuff will continue and get worse if people don’t go to jail. This stuff will continue and get worse if people dont go to jail. In Illinois, people DO go to jail. It still doesn't stop them. The Justice Department would be on this if it were calibrating to the right. Especially in the Peoples Republic of Illinois. Diebold source code has been hacked, not new news. Hmmmm. I could ask you the same question about your question. But then, you could ask me the same question about your question about my question. This could go on forever until, finally, the world collapses in on itself and implodes in a beautiful massive fireball. Which, of course, no one will be able to see because the black hole that will be created will absorb any light that tries to escape. Plus we'd all be dead. So, to avoid that tragic consequence, let me simply reply, what were we talking about again? It should be impossible for this to happen. If touchscreens cannot be permanently calibrated or periodically checked, they should not be used. OK, here’s some free armchair engineering that would prevent this from every happening. Yes, touchscreens vary and some means of calibrating them to a particular screen is technically necessary. But pay the supplier to do an initial alignment so that they come as nearly perfectly-aligned as possible, and then limit the calibration parameter range so that it is possible to correct for minor misalignment but never possible to change the alignment enough to allow a different candidate to be chosen. For example, if the separation between candidate names on the screen is 1/2 inch, them make it impossible for the calibration process to change the alignment by more than, say 1/4 inch, and this will never happen again. 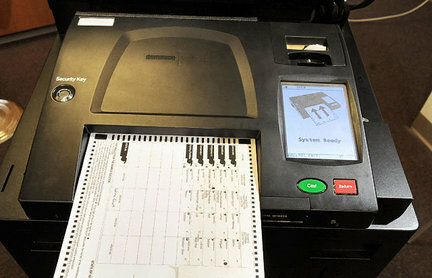 Part of the set-up process would be to run the calibration all the way to each extreme and prove that it is impossible to select the wrong candidate. At worst, a calibration error should make it impossible to select ANY candidate, never a different one than desired.